The Chelsea revival may be real after all. 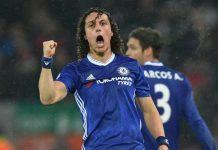 A five-match unbeaten run will be music to Chelsea supporters’ ears, as the Blues avoided a potential slip-up against a spirited Scunthorpe United with a 2-0 victory at Stamford Bridge. While the unbeaten run shows that results are finally turning the way of the Blues, the most important thing is that this Chelsea side have seemingly rediscovered the swagger and confidence of a team that won the Premier League last season in such dominating fashion. That was evident early on, as the Blues seemed much sharper than their opponents with Cesc Fabregas once more showing his ability to dictate the tempo and Pedro, Oscar, and Diego Costa providing some wonderful interplay that has been sparsely seen this season. It seemed to rock Scunthorpe back on their heels, as the visitors began to sit off their opponents and were punished just 13 minutes in. Branislav Ivanovic’s cross from the right found Diego Costa near the penalty spot and the ball flicked off the striker’s left boot and past Luke Daniels for the opener. There may have been a hint of an own goal about it, but the striker will gladly claim it for his eighth goal of the season and his fourth in his last three games. 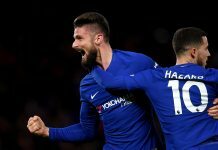 Chelsea continued to search for a second to put the game to rest against their shell-shocked opponents, creating multiple good chances. Fabregas’ 25-yard rising shot forced a great save from Daniels, Pedro fired high and wide after Fabregas found him with a long ball over the top, and Oscar curled one just past the far post after a good one-two with Costa, as Chelsea saw out the first half with relative ease. The visitors, however, began to settle down much more in the second half, deciding that it was time to stop showing so much respect to the opposition and start having a go at them. Asmir Begovic nearly gifted the visitors an equalizer in the 52nd minute when he made a mess of a clearance, firing the ball straight to Neal Bishop. Bishop’s ball released Patrick Madden down the right-hand side, but Kurt Zouma read the cross expertly to spare his keeper’s blushes. A minute later, Scunthorpe had a big shout for a penalty when Kevin van Veen tumbled in the box under a challenge from Ramires. Referee Craig Pawson waved play on, much to the chagrin of the Scunthorpe players, and on replay, they may have had a reason to feel aggrieved. That didn’t stop Scunthorpe from continuing to harass and press the Chelsea players, but their resolve would be broken in the 68th minute from an unlikely source. Ruben Loftus-Cheek, on for Oscar at the start of the second half, scored his first goal for the Blues with a cool finish inside the area. The youngster read Cesar Azpilicueta’s pull-back and guided the ball inside the near post to give the Blues a vital 2-0 lead. Despite the setback, Scunthorpe, to their credit, continued to search for a goal. Van Veen’s curling free kick from the left just missed the inside of the near post and Jordan Clarke’s thumping effort from the right side cracked the woodwork simply summed up the day for Scunthorpe, as Chelsea put on a professional performance to see off the League One side. Next articleTransfer Centre – Bacca deal close, Arsenal want Aina, Sampaoli interest.